Order a noodle bowl, spicy stir-fry or curry at the counter. Sub tofu for meat on any dish. 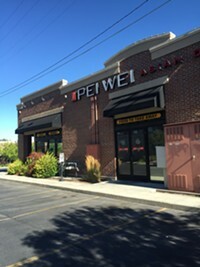 At Pei Wei Asian Diner in Salt Lake City, you'll discover what the Pei Wei folks call "East of usual." That is, innovative pan-Asian cuisine in a fast food setting. Hand prepared cuisine at Pei Wei includes Chinese, Japanese, Korean, Thai and Vietnamese dishes. Signatures dishes include a choice of chicken, beef, shrimp or tofu and vegetables in flavors such as Mandarin kung pao, Thai coconut curry, Mongolian, spicy curry, orange peel and ginger-broccoli. Small plates include edamame, crab wontons and chicken lettuce wraps.